Coral can lose their color without losing their lives. The biology behind coral’s color is less straightforward than it seems and makes them vulnerable to a phenomenon known as bleaching. 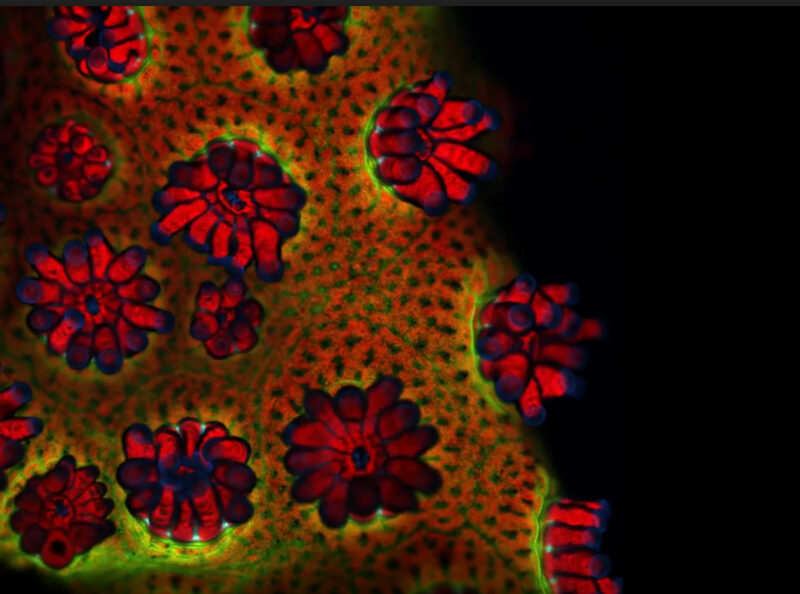 Animals, plants, fungi and microbes constantly interact with one another. Sometimes this interaction becomes a bona fide relationship. Scientists call these relationships symbioses, and their natures are diverse. On one end is the parasitism of viruses, which take advantage of a host to reproduce, often at the host’s expense. On the other end lie the mutually beneficial interactions between certain gobies and pistol shrimp. The myopic but handy shrimp digs a burrow for the pair while the keen-eyed fish keeps watch for predators. Some species become so entwined with one another that one actually lives inside the other. 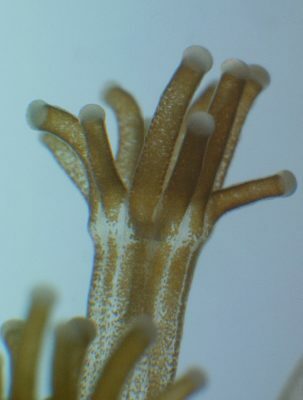 This is the case in most coral, which host symbiotic algae inside their cells. The relationship is strikingly visual. Nearly all of a coral’s dazzling colors, which range from greens and violets to yellows and browns, actually come from its algae. Algae get their energy from the sun via photosynthesis, just like plants, and share some with their coral host. This ability proves handy in tropical waters, like the Red Sea or the Caribbean, where sunlight is plentiful but nutrients are often scarce. The coral, in turn, provide the algae with shelter and certain nutrients their tenants need. Stress, however, can alter the balance of the relationship to the breaking point, whereupon the coral evicts the algae. The phenomenon is called bleaching, since the coral’s usually white skeleton becomes visible once the colorful algae are gone. Higher temperatures, brighter light and lower salinity trigger bleaching. Evidence suggests that these factors increase the algae’s photosynthetic activity. As the algae photosynthesize more quickly, dangerous levels of oxygen radicals — the same type that we combat with antioxidants in our diets — build up inside the coral. This oxygen is more chemically reactive than the oxygen normally produced by photosynthesis, and it begins damaging the coral’s cells. The damage signals the coral to expel the algae, leaving it bleached. Now vulnerable without its main source of food, the coral must quickly acquire new algae before it wastes away. Since coral often hosts many types of algae, sometimes it can simply switch to a type better adapted to the stresses that caused the bleaching. The coral can also acquire free-floating algae from the water around it, though this is harder to do. However, in cases of severe or total bleaching, the coral will simply die. Unusually warm conditions this past summer bleached and killed over 70 percent of coral in the Sekisei Lagoon, Japan’s largest coral reef. Large bleaching events have become more frequent as the climate and oceans change. Stressful conditions, like higher temperatures, can leave many square miles of coral reef bleached and dead. The summer of 2015 witnessed worldwide bleaching events. The tropical weather pattern El Niño and a patch of warm water in the Pacific called “The Blob” exacerbated already high summer temperatures that year. Less than a year later, record water temperatures left 63 percent of the northern Great Barrier Reef dead as the Australian summer came to a close last April. And just this month, reports have emerged that the Great Barrier Reef is undergoing another massive bleaching event. Terms like “unprecedented” and “dire” no longer seem to convey how unprecedented and dire this trend is. Reefs support a blinding diversity of marine-life, including many economically important fish species like parrotfish, snappers, and groupers. Scientists estimate that 6 million people fish on reefs worldwide, accounting for slightly over a quarter of the world’s small-scale fishermen. Coral reefs also protect coastlines from storm surges, and are important sources of sustenance and revenue for small island nations. A bleached reef often becomes a dead reef, which no longer provides these crucial habitats and services. As ocean conditions become increasingly unfavorable, marine scientists hope that a better understanding of the symbiosis between coral and algae may help us avert the devastation of places like Sekisei Lagoon in the future.